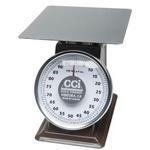 The CCi HCD Series 10 inch Spring Dial Scale, as it utilizes a 10 inch dial that reads in ounces and grams. These are good for when estimating weights for personal or in-house weighing. They may be used for light parcel shipping or portion control.